Sometimes we need to let the little ones win so they can taste success and learn. I recently purchased John Will’s Alpha Mixed Martial Arts Program, which is excellent. In it Will states that when teaching a new technique, you should never teach its counter move because you want to create confidence in your students. And that means letting them be successful at performing it. This makes a lot of sense to me. Will also states that a good training partner will not always resist, because it is important that the student sees the technique work in action. At the same time he should not make it super easy so you will learn how to apply the proper pressure. I am disappointed when I see black belt instructors refuse to give their students a chance to be successful. 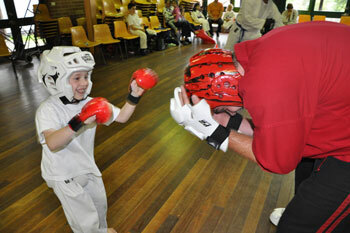 Ego gets in the way of being a great teacher as well as a good martial artist. I always make it a point to show a student a great move for point sparring and then let them score with it. On me. I don’t care if the rest of the class thinks they got a point in on the sensei. I am past the point of trying to impress. When rolling on the mat I will sometimes guide my students into what moves might work next, even letting them tap me out with them. How else will they learn the technique, except by being successful at it? When I see someone get really upset because they lost at a martial arts competition I realize they probably care more about the damage to their ego than the lessons learned from the experience. Others never compete because they are so afraid of losing and looking bad. Either way, losing is part of life and handling a blow to your ego is part of growing up. The ego is a voice inside you that says, “I am special, higher, better, bigger than you”. We can never satisfy it. It is always greedy, it is always grabbing, it is always searching for more and more. It is like a parent that is never happy with our accomplishments. Don’t listen to it. Letting go of the ego and caring less about how we look will give us the same carefree attitude we had as a child. Just have fun, enjoy the process, and learn. Helping your students win means sometimes you have to lose. Martial Arts | Ego is Not Your Friend is an original post by Sensei Matt Klein. You have to be capable of losing and learning everything possible from that experience. If you have ego all you’ll want to do is make excuses – if your humble and self aware you’ll be able to minimize your mistakes in the future! So true Sean about ego getting in the way of greatness. By the way, stopped by your website and really enjoyed it. It is a great resource for MMA techniques.